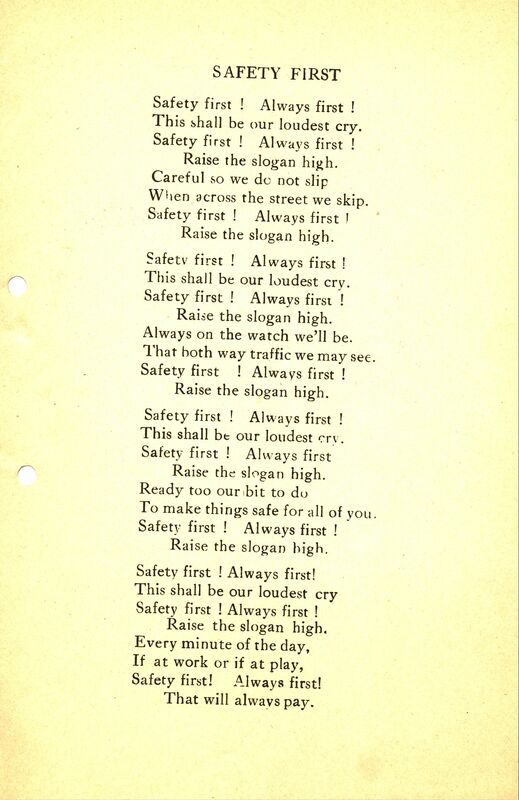 “Safety First” poem from Corkery Elementary School poem book, circa 1926. Corkery School is located at 2510 S. Kildare in Chicago. 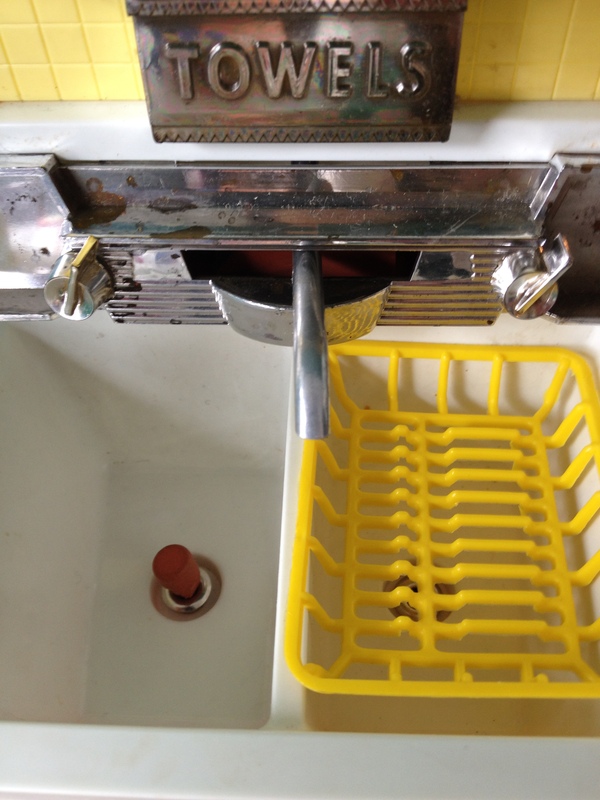 This entry was posted in Uncategorized and tagged Chicago, Corkery School, poem, safety on March 23, 2014 by sgolland. 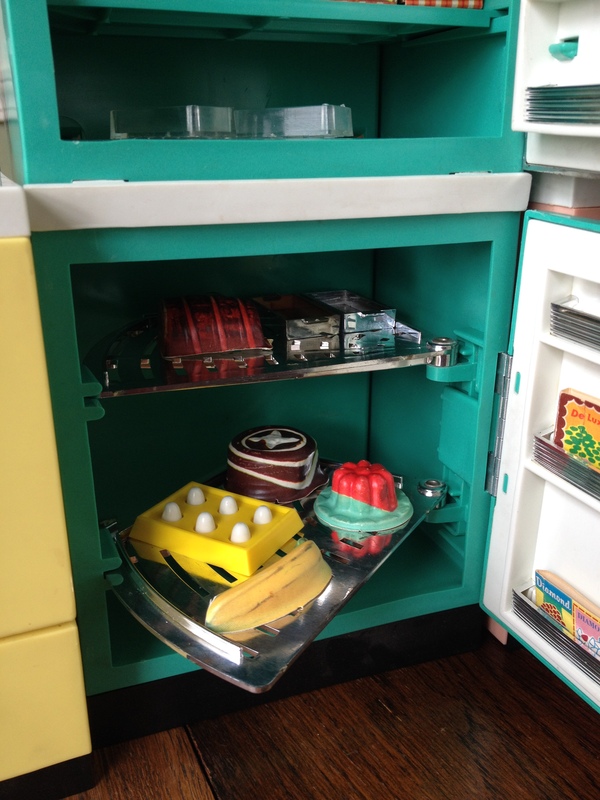 My mother, sister, and I got together yesterday to play with a favorite toy that we grew up with, the Dream Kitchen. 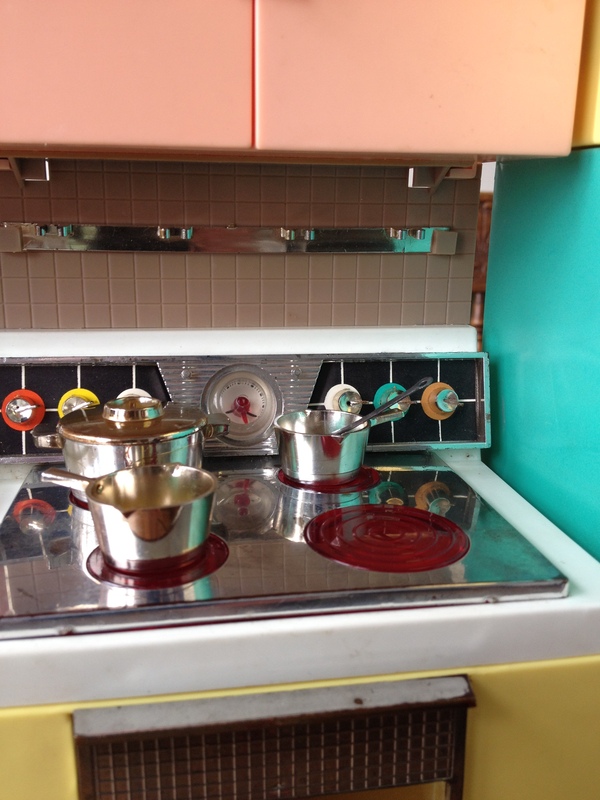 My mother and her sisters got the set sometime in the 1960s and after years of gentle use it was also enjoyed by their children, including my sister and I. The Dream Kitchen lived at my grandparent’s house and after many years of sitting in their basement, we decided to take it out for a few photos and to enjoy the same things that we loved about it when we were younger, especially the battery powered rotisserie chicken. 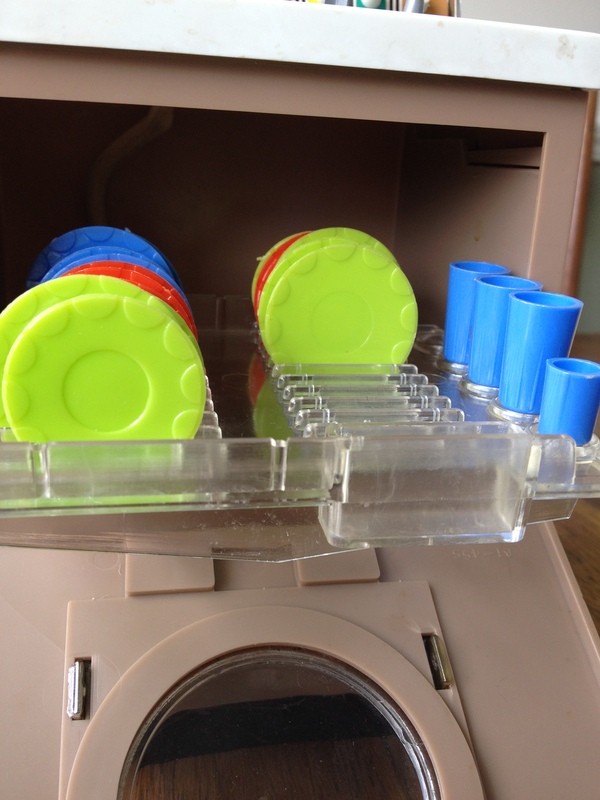 The Dream Kitchen is made of of four main modular plastic units: a dish washer, refrigerator, oven, and sink, plus a table and chairs. The sink and dishwasher have water reservoirs that allow them to really work (with some minor leaks); the oven unit has a range that lights up and a rotisserie chicken turns in the oven; and the refrigerator, well, it just looks cool. 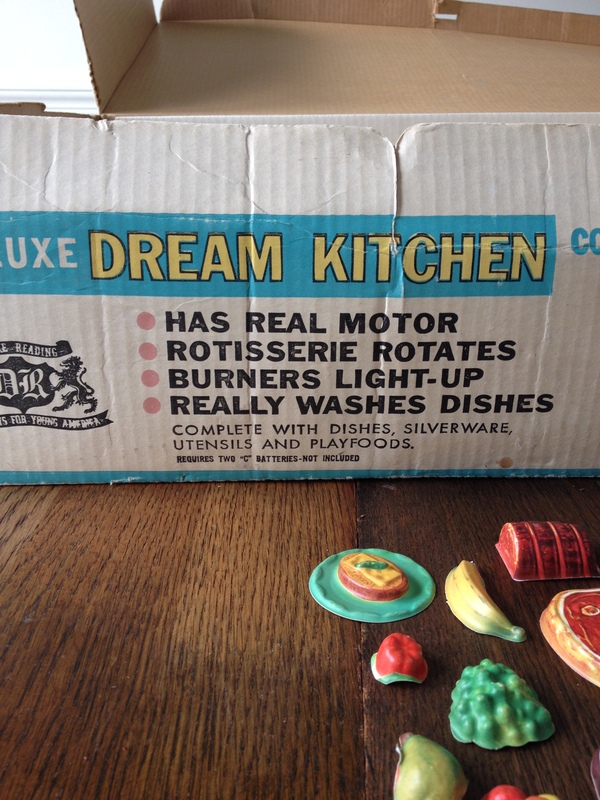 In addition to the main pieces, the Dream Kitchen also comes with a host of accessories including plates, silverware, boxes of food, and other fake edibles. 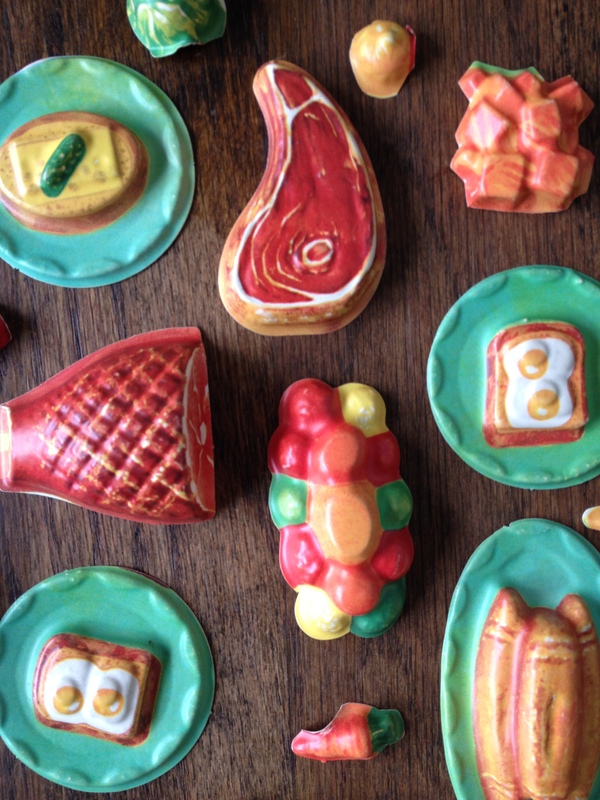 In total the set was said to come with 176 pieces; I did an inventory of what we had left after all these years and I counted 150 pieces and can’t imagine what we are missing (maybe a plastic steak or two). 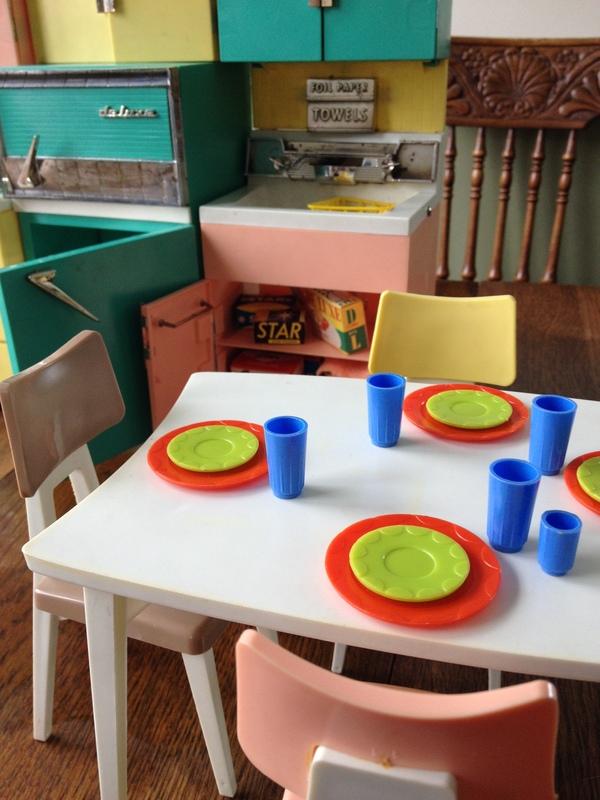 This entry was posted in Uncategorized and tagged 1960s, barbie, doll toy, Dream Kitchen on March 9, 2014 by sgolland. 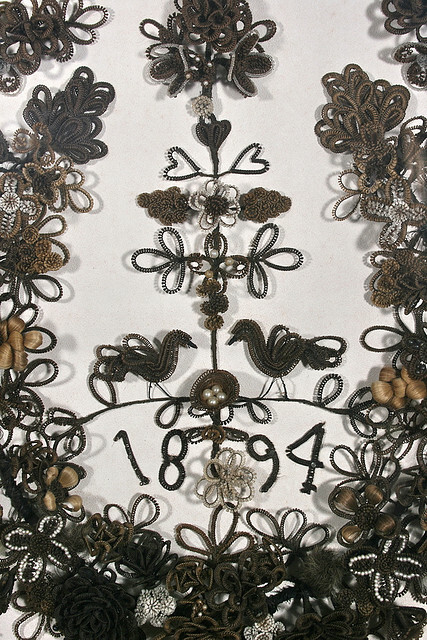 In the mid-19th century, making jewelery and art from human hair was not unusual. Hairwork was considered a ladies handicraft, a category that included activities like drawing, painting, and fashioning decorations from natural objects like shells, moss, and feathers. Many people think that hairwork was only made from the hair of the deceased as a memento of a loved one’s passing. 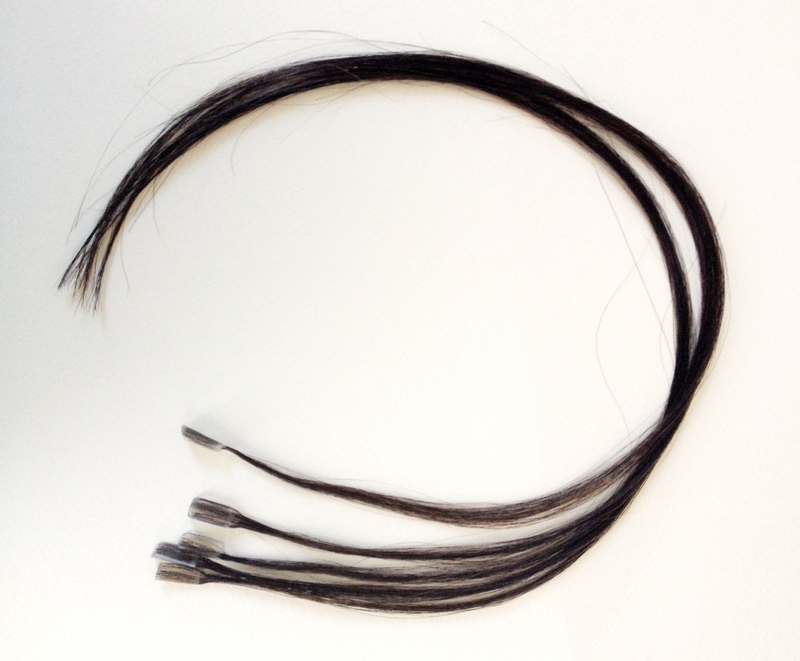 Though some hairwork was made for this purpose, other pieces were collected from living friends and relatives, and served as a visual display of personal connections. 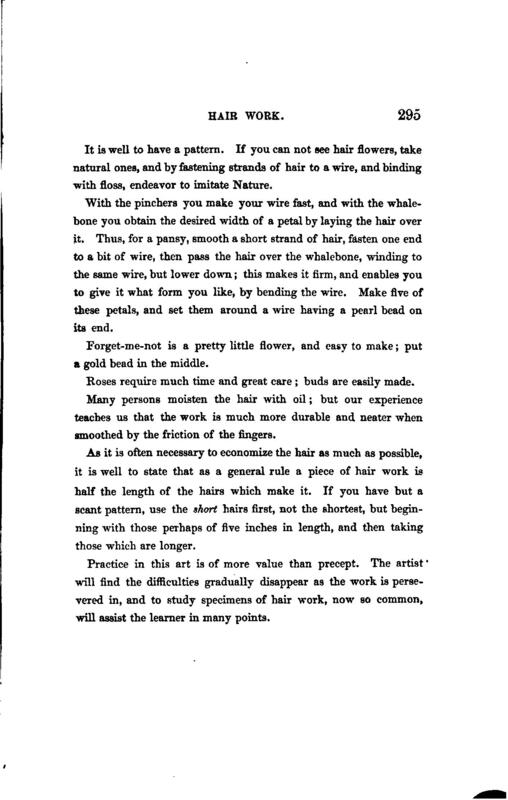 If you are interested in learning how to make Victorian-era hairwork, there are already some resources online, but these are fairly scarce. 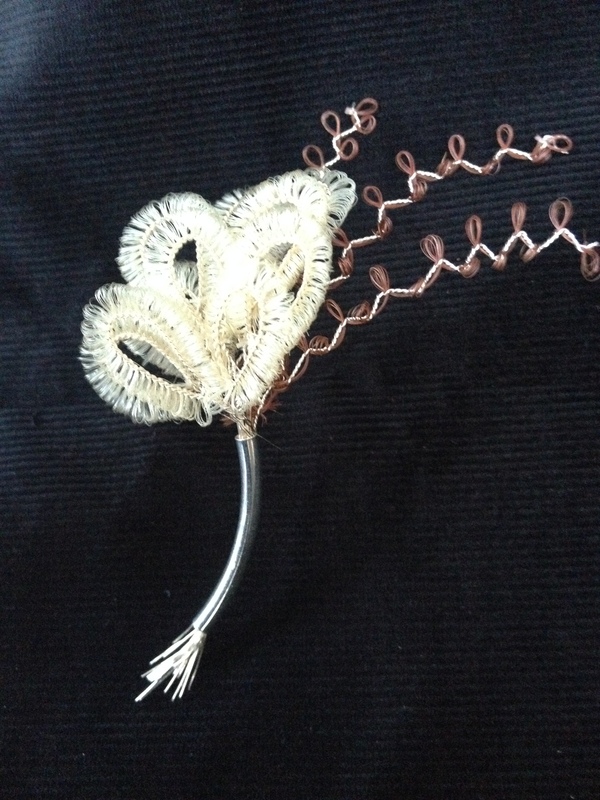 One of the styles that seems to have the least documentation is hair flowers, which are made by wrapping hair around a knitting needle (or something similar) and securing it with wire. In this post, I will cover one of the basic techniques for making these flowers. First, let’s begin with primary source material. 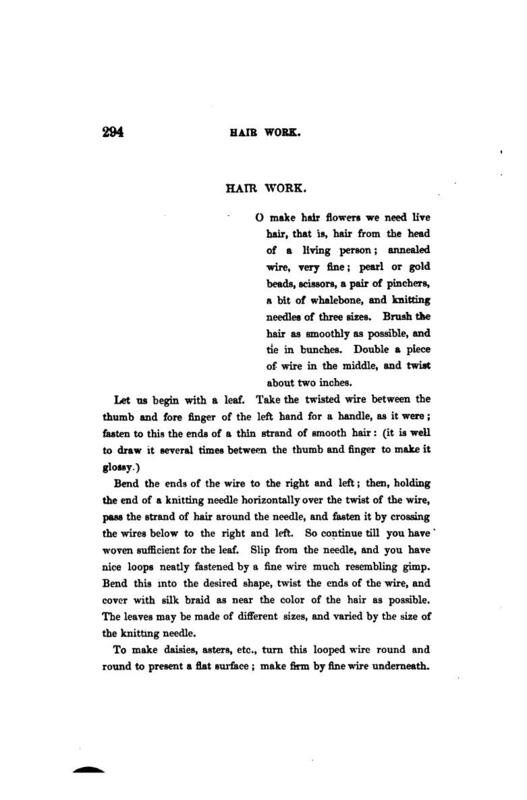 The 1860 book, Art Recreations by Mrs. S. R. Urbino and Henry Day provides a description of how to fashion flowers from human hair. 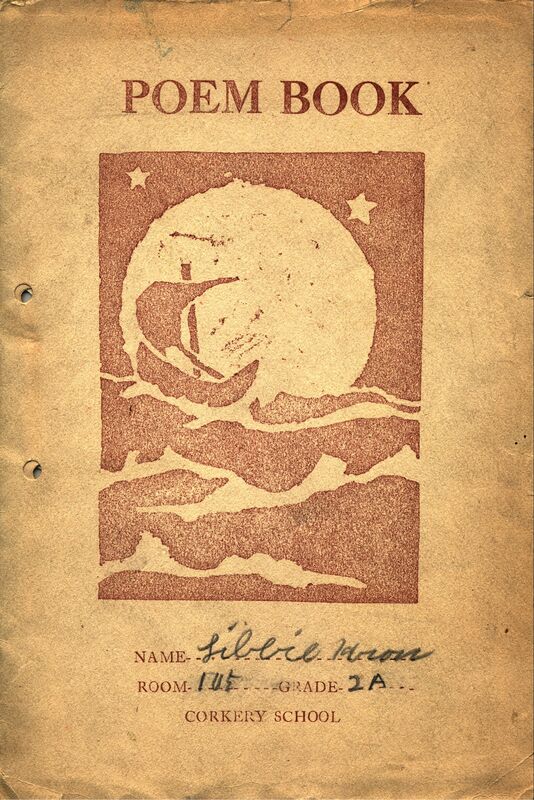 Art Recreations is available in full text online via openlibrary.org. The technique I will outline in this post is based on these instructions, but uses some modern materials that improve on this process. I bought a small package of hair extensions at a beauty supply store for about $20 which were grouped together with plastic tips. 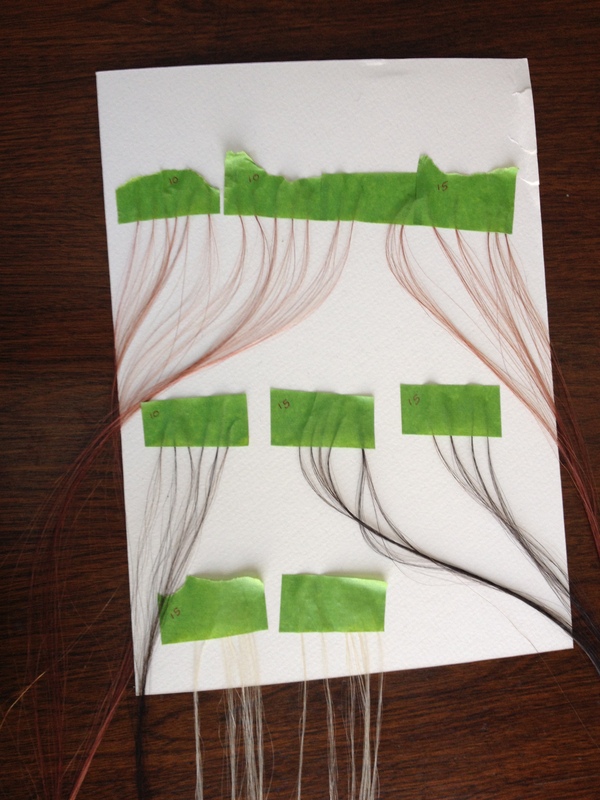 To prepare the hair, I cut the plastic tip off of one of the bundles and divided the hairs into groups of fifteen strands. I used a hot glue gun to secure the strands to keep them from slipping out later on in the process. A word of warning: this is incredibly tedious; I recommend turning on your favorite TV series as you work through this step. 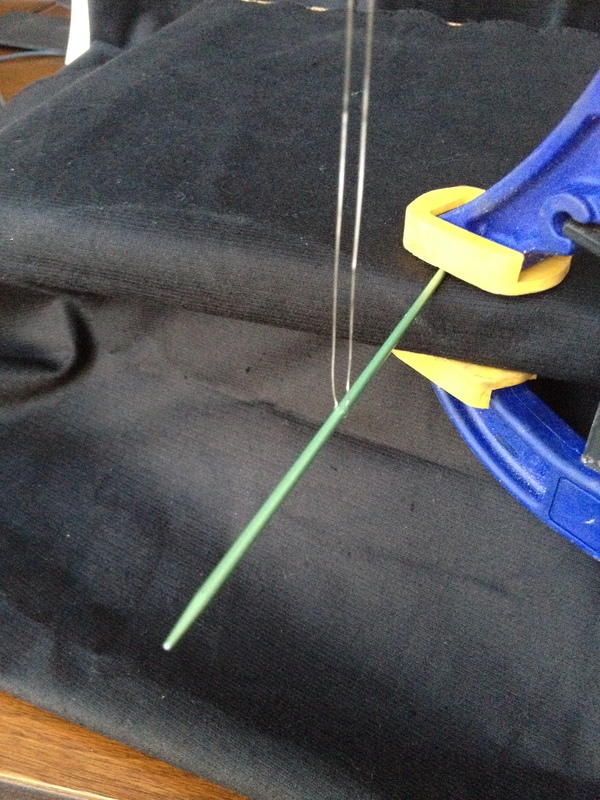 Clamp a knitting needle to a table or board. This will be your workspace. 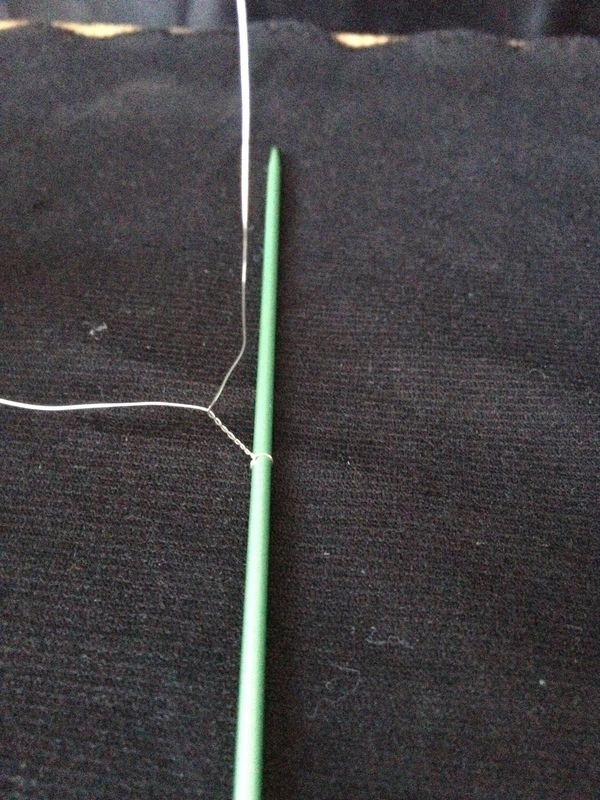 Cut a 10-12″ length of wire and fold it in half around the knitting needle as in the picture above. 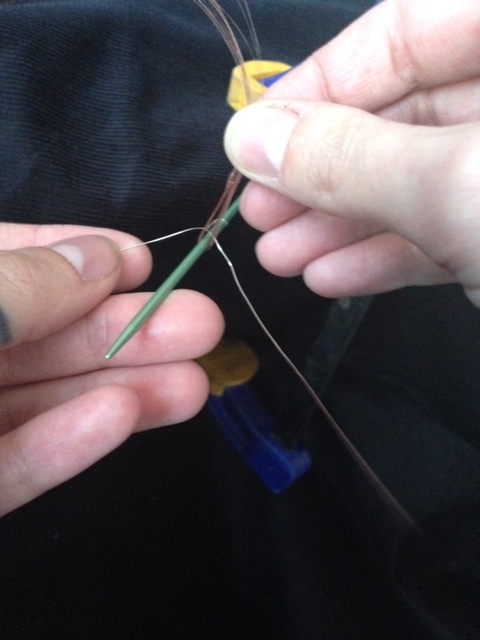 Begin by twisting about 1/2″ of the wire in a clockwise direction. Cross the right wire over the needle, and then cross the left wire over the right. You have just completed the first loop. To make the next loop, wrap the hair around the knitting needle in a counterclockwise direction, then cross the wires over one another again. 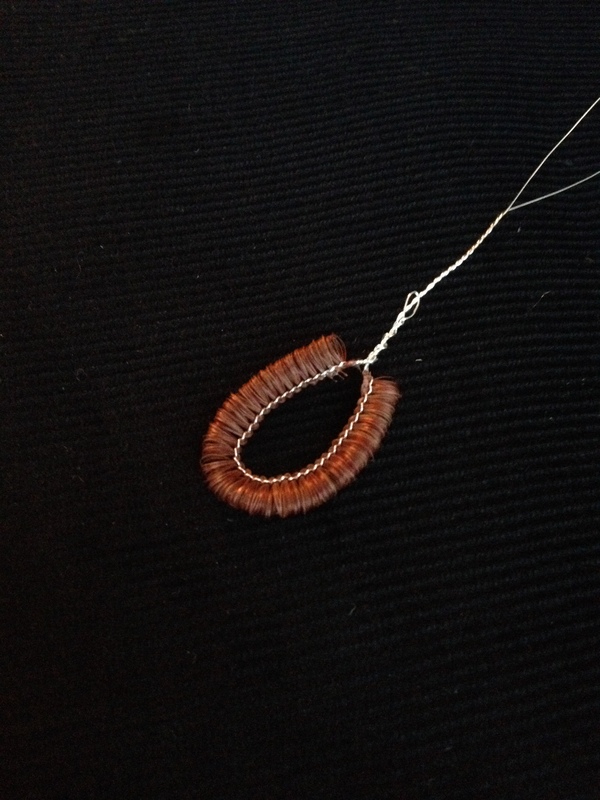 The most challenging part of making loops is to keep the hair and wire tight. 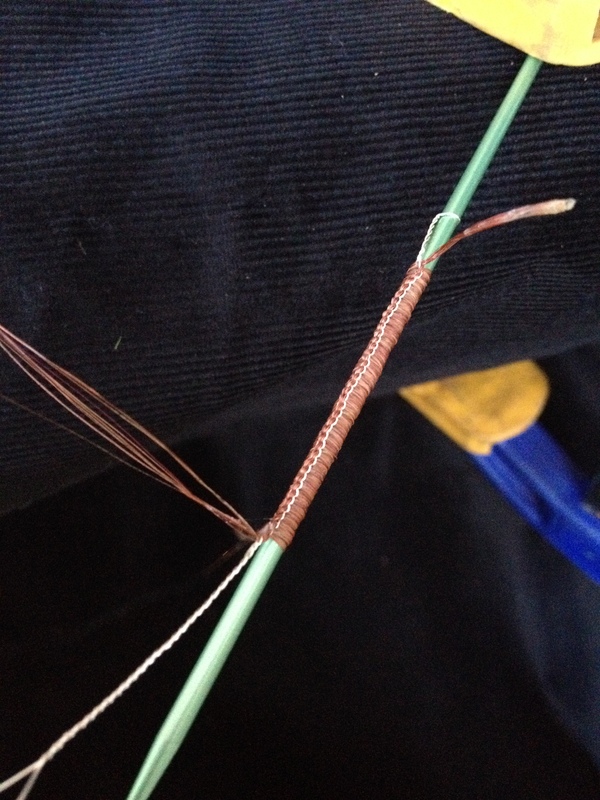 If your wire is too loose, your loops will not hold fast; if your hair is not pulled tight, your loops will look uneven. Repeat the wrapping process until you run out of hair. 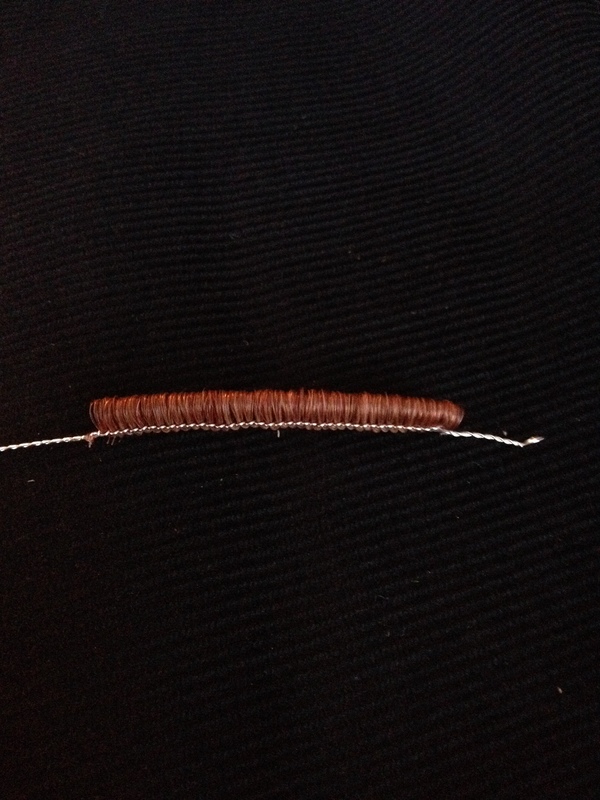 To finish, twist the remaining wire and use a small amount of clear nail polish at the base of the strand ends to keep the hair from unraveling. Once the nail polish is dry, trim the excess hair as close to the wire as possible. Now is the moment of truth. Gently slide the hair off of the knitting needle. 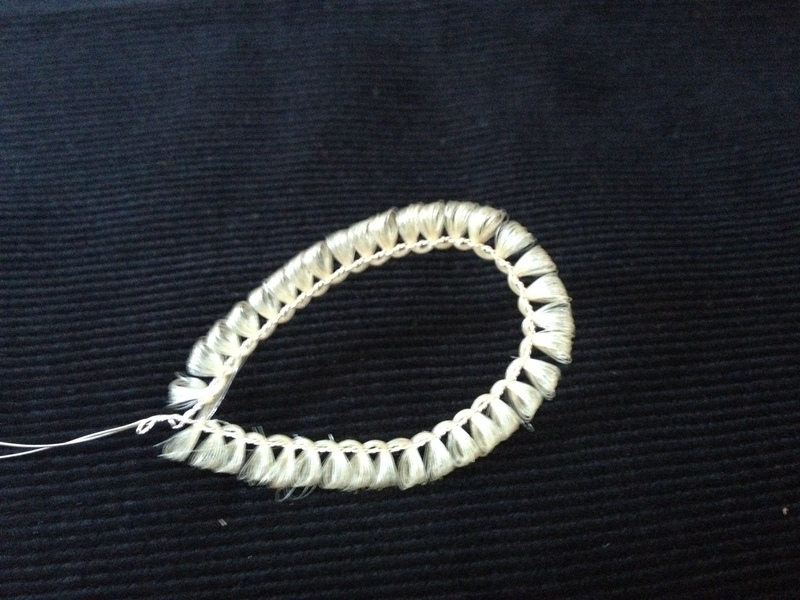 By connecting the twisted ends, you can create a simple petal. You can group several petals together to make a flower, or create whatever pattern strikes your fancy. In a future post, I will show examples of a few variations on this basic technique, including the zigzag pattern shown above. This entry was posted in Uncategorized on January 26, 2014 by sgolland. If you live in Chicago, you might have noticed that it’s been rather cold outside. Today it was about 5 degrees and it seemed warm enough to go outside without a hat on. So the other day during our deep freeze I spotted a dead pigeon on the ground on my way to work. Somehow a frozen dead pigeon sounds more interesting than an unfrozen one. 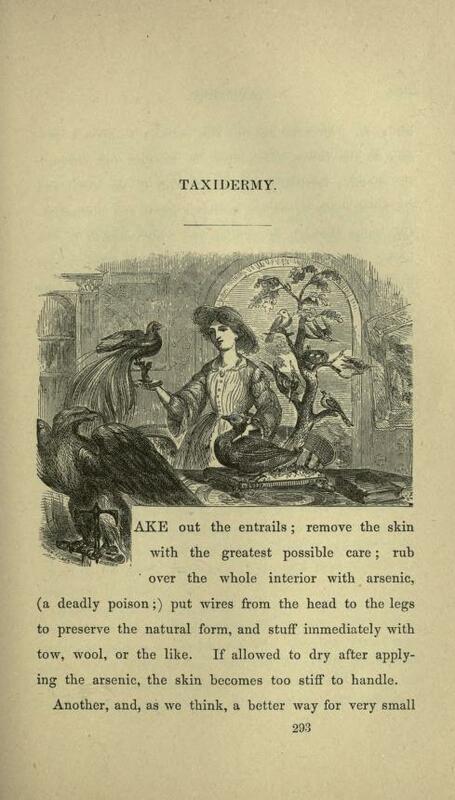 Or maybe it was more interesting because I just read this two-page guide to taxidermy from the 1884 book Art Recreations: A guide to decorative art. Did you have any idea that taxidermy could be so easy? Obviously taxidermy experts have been hiding something from the masses by making us think that we need special training to practice their art when all we really need is some extra pillow stuffing and arsenic. This entry was posted in Uncategorized on January 9, 2014 by sgolland. Animal Cake Carnage! The Tradition Continues. Some traditions die hard. Like bringing fruit cake to Christmas dinner. There’s the off chance that one family member actually loves edible paperweights but I think most of us wonder why this dessert continues to find its way to the table. 1) You cannot bake a lamb cake without the help of toothpicks. Toothpicks to support the delicate ears are a must. 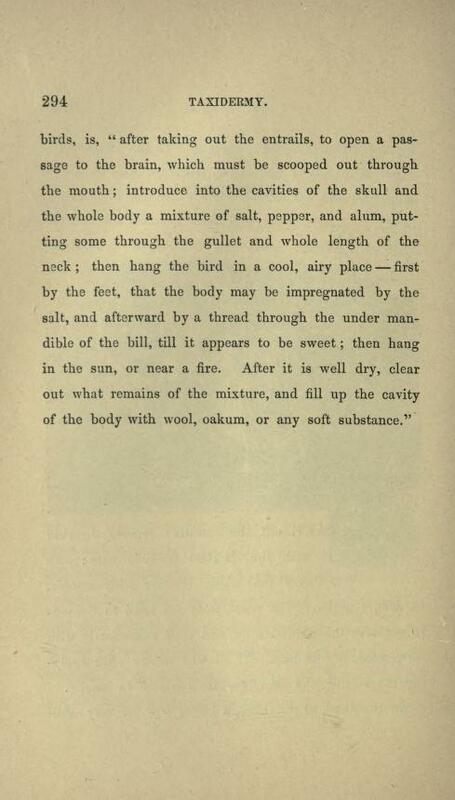 If you use supplemental toothpicks to support the head or body, you probably didn’t grease the mold well enough and you had to perform some sort of miraculous extraction procedure to remove the cake. 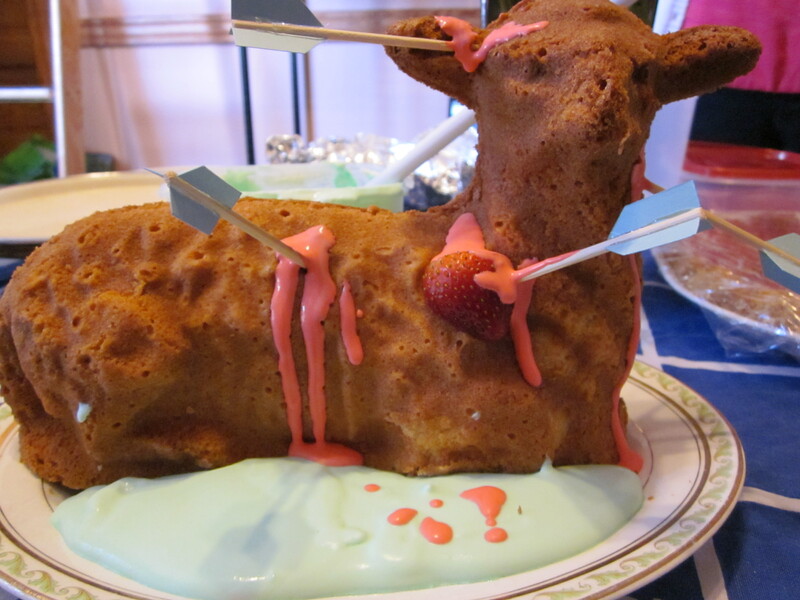 Or you decided to get creative one year and make a giant brownie lamb cake…never again. 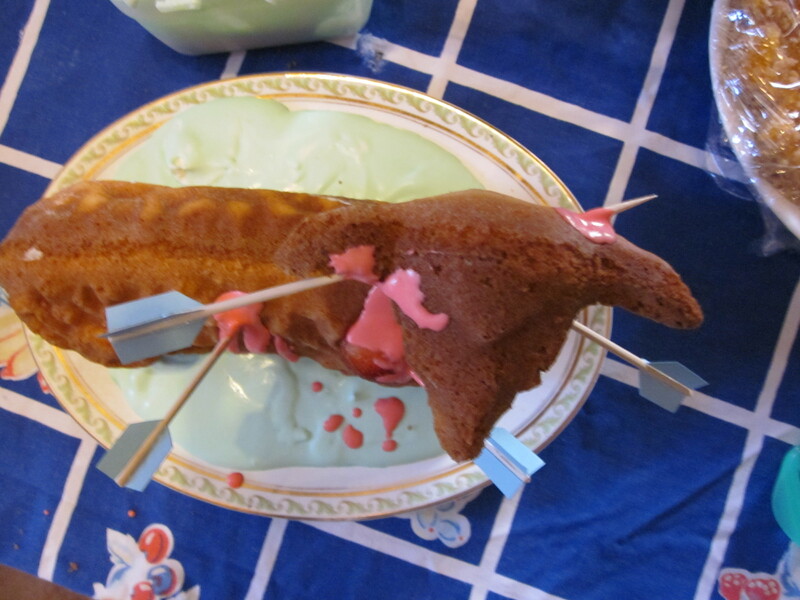 2) Frosting and simulated “fleece” help to hide baking failures. I prefer my lamb cake to have the “freshly shorn” look so I usually leave the frosting off. However, the addition of frosting and shaved coconut (“fleece”) hides even the most disastrous baking failures, like the giant chunks of cake that got stuck in your mold. I don’t think anyone would miss my annual lamb cake if I didn’t bring one next year. Yet I think I haven’t exhausted the creative possibilities of the medium so I’m going to keep up the tradition a little longer. For this year, readers, I present my latest creation which I’ve named “Bow & Arrow Season.” Happy Easter all. 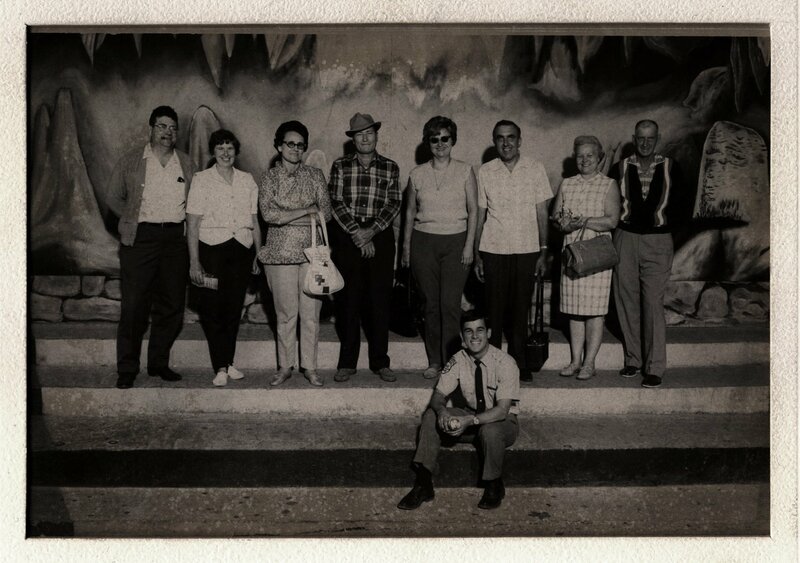 This entry was posted in Uncategorized on April 8, 2012 by sgolland. 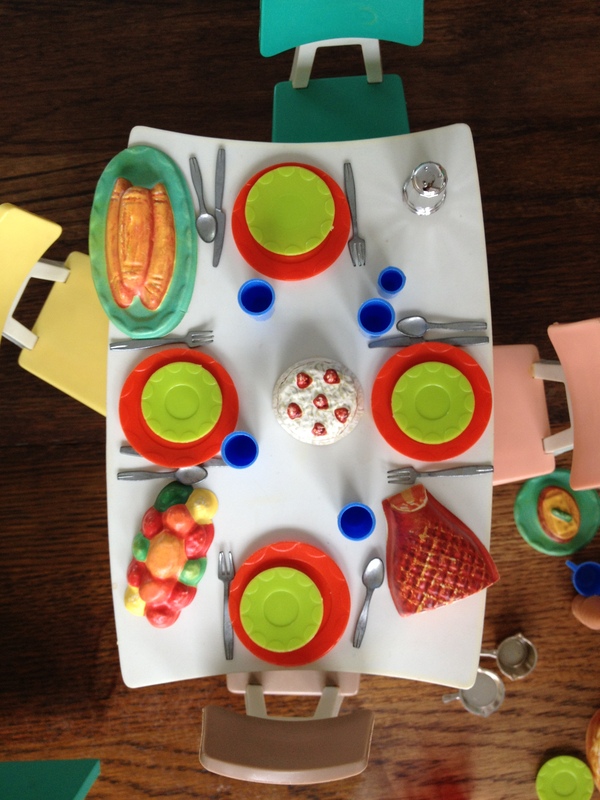 Blog readers, I have missed you (all five of you). 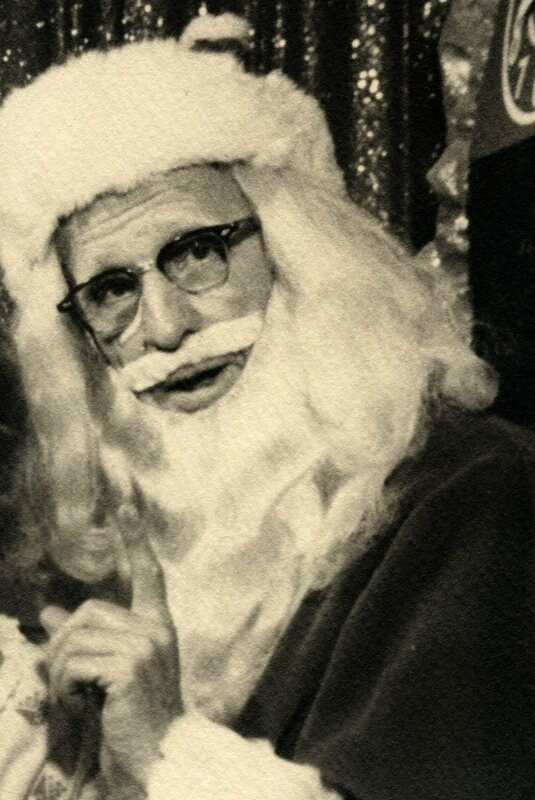 I can’t think of a better time to jump back into posting to Special Collections than Christmas time…because it is time to make fun of Santa. b) Santa is sitting too close to the child. 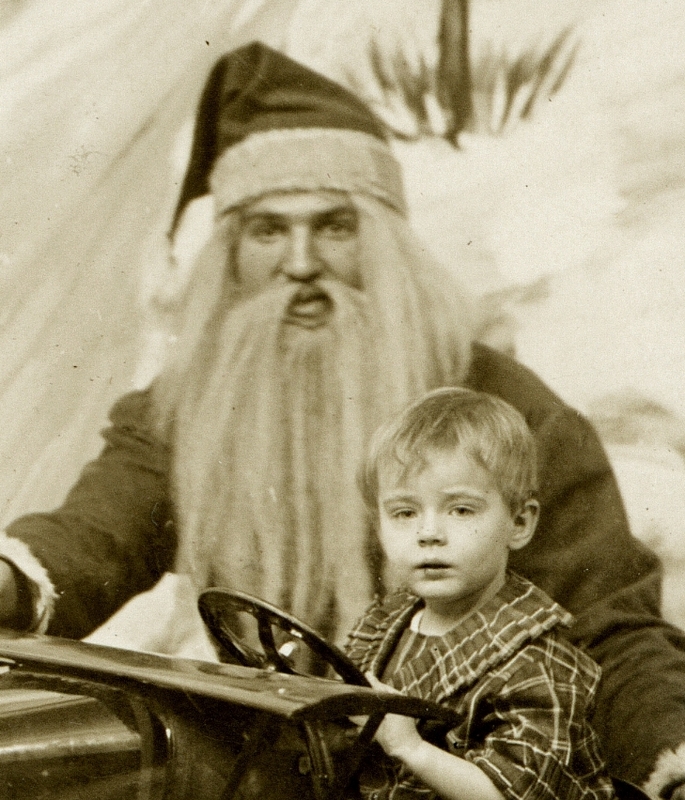 Maybe back when they took this photo Santa was actually allowed to let a child sit on his lap. Are we even allowed to do that anymore? If we do, it’s highly inappropriate. c) Facial expression. I don’t even know what to say. Way creepy. You may be troubled to know that this bad Santa thing is not an isolated incident. Ok. I found both of these photos without even trying. Can you imagine what I might find if I made an effort? I shudder at the thought. The point here is that there are lots of bad Santas out there (including the Santa that gave me a DESK LAMP for Christmas one year…thanks for nothing). I encourage you to call out these bad Santas, and, if nothing else, help them properly adjust their beards. This entry was posted in Uncategorized on November 28, 2011 by sgolland.